EX-91 points for Bookem daughter Silvy! Aghavilly Meridian Carry ET VG-86-UK 3yr. Leaderwin DG Mythe VG-86-UK 3yr. Aghavilley Earnhardt P Silvy VG-85-UK 2yr. #2 GTPI Polled Heifer in Europe!! Fernycleugh Cashmoney Cindere VG-87-UK 2yr. Bouw Woodstock Celine GP-84-UK VG-85-MS 2yr. Bouw Snow Lotte GP-84-UK 2yr. 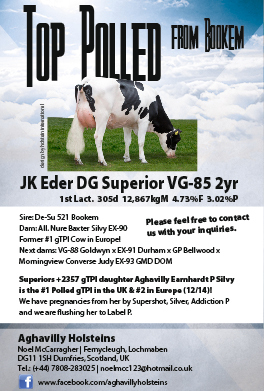 Jk Eder Ina GP-84-UK VG-87-MS 2yr. Bouw Snowman Carry VG-85-UK 2yr. Vekis Sudan Mairy VG-85-UK 2yr. DKR Palermo Bacina VG-86-UK 2yr. Maternal sister to the #2 RZG Cow in the Breed! Aghavily Holsteins has been investing in interesting pedigrees for over a year and now has some really good international families based in this south Scotland, high health status herd. 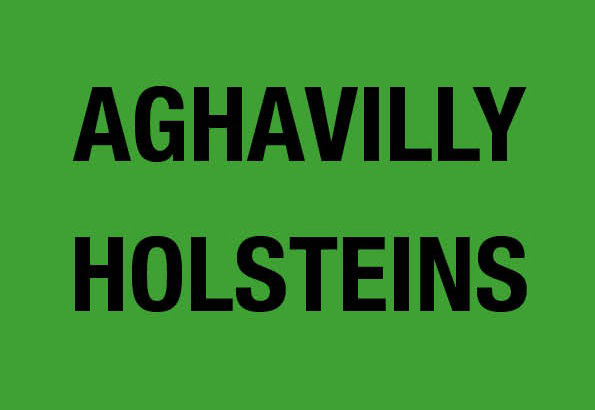 There will be many more great pedigrees to come from Aghavilly Holsteins.